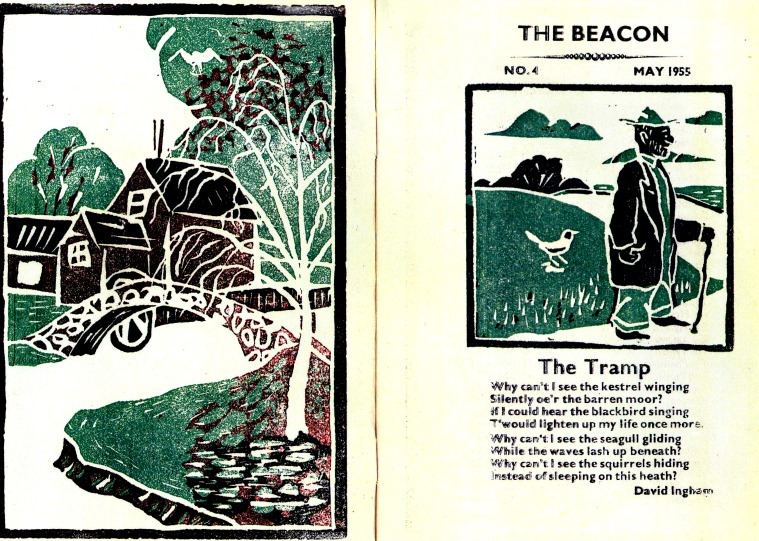 In the 1950s and ‘60s, ‘The Beacon’ was the school magazine produced, designed, printed and published every year by children in the senior form of Banstead County Primary School (which used to be on the site now occupied by Waitrose). This is the frontispiece and first page of the 1955 edition, published in May that year. The magazine – this one ran to 56 pages – comprised poems and short stories, plus imaginative lino cut illustrations, all done by 11-year-olds under the supervision of their well-liked teacher, Mr Jones. In their review of the year, the children remark, “Our printing machine is NOT electric, and none of us belong to any trade union, so the printing and publishing of The Beacon was not slowed up by the newspaper strike.” This was a reference to the 1955 month-long strike by Fleet Street maintenance workers which led to a shut-down of the country’s national newspapers. The contributors to ‘The Beacon’ in 1955 were Wendy Atkins, Christopher Bailey, Hazel Battersby, Suzanne Birch, Peter Bleasby, Jonathan Carpenter, Adrian Coulman, Alan Coulman, Rosemary Curtis, Peter Denton, Sally Duncan, Graham Firth, Anne Happold, David Hopkins, Lynda Huxley, David Ingham, Roland Knight, Derek Leedham, Janice Mihalop, Olive Matthews, Peter Moody, Keith Morris, Christopher Osgood, Ruth Pattisson, Anthony Putman, Michael Seager, Frances Stock, John Walker, Anthony Wicking, Neil Woodward and Roger Woolley. Where are they now…? The printing machine was an Adana model with a one piece cast iron handle. I don't know the model name.